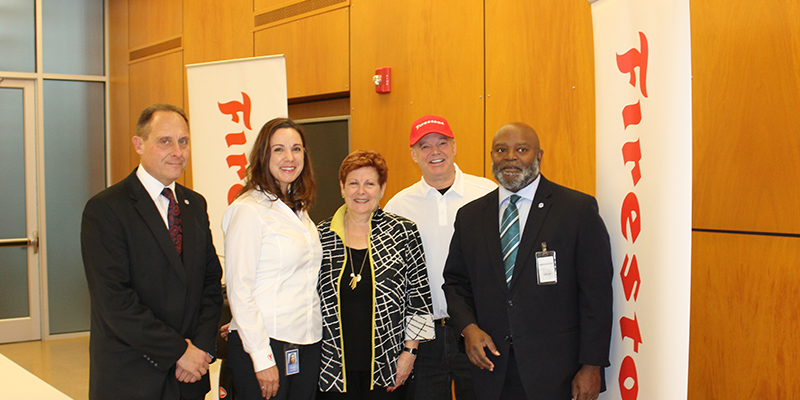 Cara Adams, chief engineer, Bridgestone Americas Motorsports; Ilene Shapiro, Summit County Executive; Al Unser Jr., two-time Indy 500 winner; and Samuel D. DeShazior, Deputy Mayor for Economic Development in Akron. Indycar and Bridgestone Americas, Inc. announced a five-year partnership extension for the Firestone brand to continue serving as the sole tire supplier and official tire of the NTT IndyCar Series through 2025. The agreement, which includes continued rights for Firestone as the official tire of the Indianapolis 500, furthers the brand’s history in open-wheel racing and its longstanding commitment to tire innovation. The news was shared at a special event in Indianapolis that included IndyCar and Bridgestone leaders, racing legend Mario Andretti and veteran Indycar driver and team owner Ed Carpenter. A second event also was held at the Bridgestone Americas Technical Center in Akron with two-time Indy 500 winner Al Unser Jr. In addition to providing tire technology and on-track support, Firestone will continue to be a key partner in the marketing and promotion of the NTT IndyCar Series. The brand’s comprehensive, season-long activation includes fan engagement, sponsorships and signage at multiple venues, robust social and digital media programs, traditional media and hospitality. The 2019 NTT IndyCar Series season kicks off Mar. 10 with the Firestone Grand Prix of St. Petersburg, which will be broadcast live on NBCSN at 1 p.m. ET. Firestone also recently announced it will serve as title sponsor of the season-ending Firestone Grand Prix of Monterey at WeatherTech Raceway Laguna Seca, which will be broadcast live on NBC on Sept. 22 at 2:30 p.m. ET.